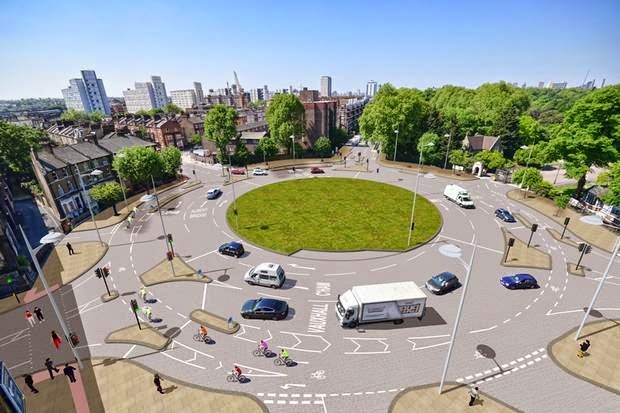 Yesterday, Transport for London announced its plans to re-design the roundabout at Queen's Circus on the corner of Battersea Park. The roundabout lies south of Battersea Bridge and is on the route of Cycle Super Highway 8. The plan is to introduce a bike lane around the roundabout. Bikes will have a separate green phase to motor traffic, so you'll be able to cycle (in theory) without risk of conflict from motor vehicles turning off the roundabout. I have mixed feelings about this scheme. road outside the park. Horrible place to cross. At rush hour, there are big queues of motor traffic mainly heading north-south across the roundabout to or from the Bridge. This makes it difficult to cross the road as there are rarely gaps in the traffic, which is absurd given there's a massive park here and a lot of people trying to get here on foot. The fact that the scheme introduces signals for pedestrian crossings is, in my view, very good news. And it is something that locals have been requesting for ages. In terms of cycling infrastructure, it is also an improvement on what's there at the moment. 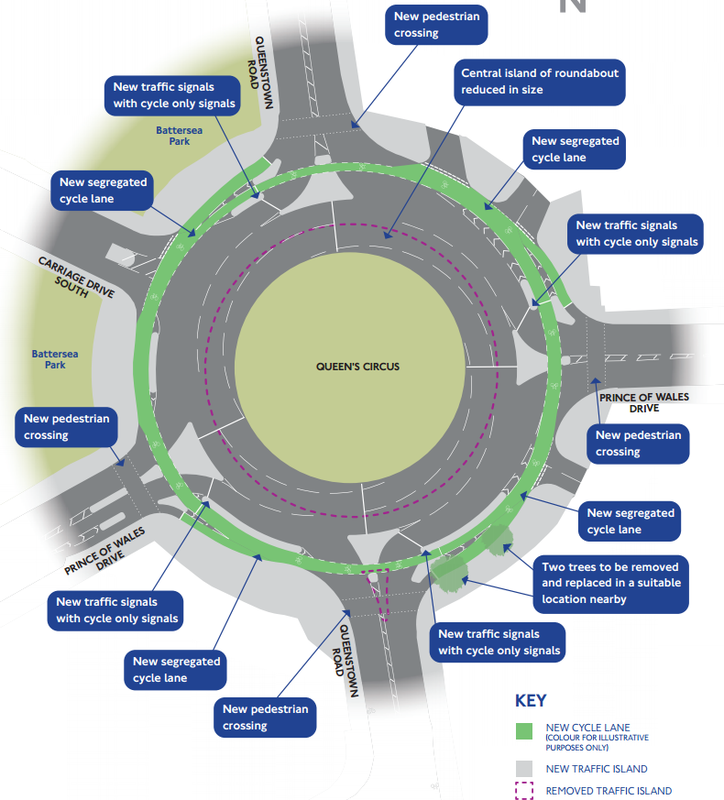 The current layout involves a ridiculous segregated cycle track that goes around the roundabout and that gives way to motor traffic at every one of the eight entry points to the roundabout. It is (with the exception of one small section) utterly unusable on a bike. So, the new scheme quite clearly provides a separate flow for people on bikes, on foot and in motor vehicles. That is a good thing. which separate the flow of motors and bikes. But I can't help thinking this roundabout could have been designed to be more user-friendly for cyclists and pedestrians. If you look at the scheme, it is littered with traffic lights. 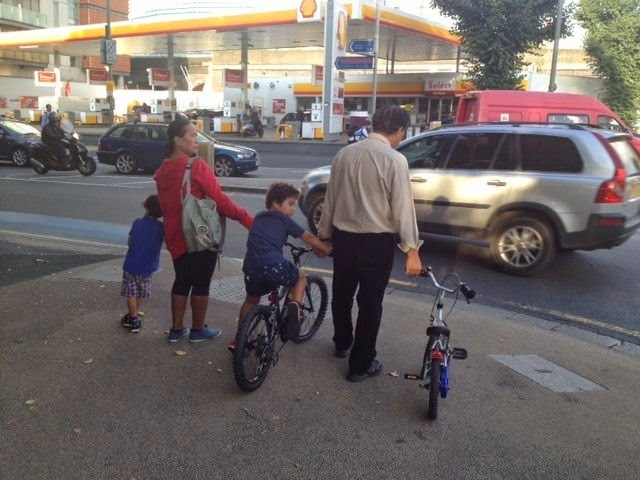 Bikes will have one set of lights; motor vehicles another set and pedestrians another set. Motor vehicles and bicycles will flow in separate phases around the roundabout, guided by traffic light sequences. It is like a traffic light engineer's dream. On first looking at the scheme, I couldn't work out why TfL hadn't gone for something simpler. 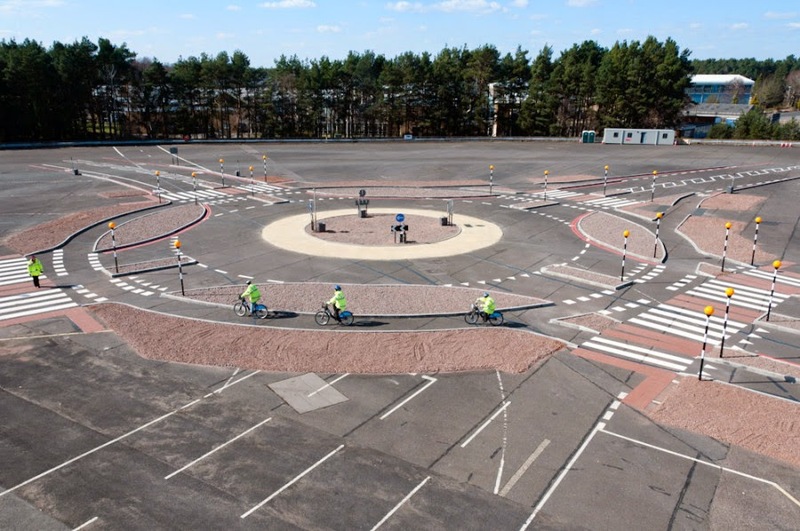 Last year, for example, TfL paid for a trial of a proper Dutch roundabout (pictured below). Building a proper Dutch roundabout at Queen's Circus would have involved pedestrian zebra crossings rather than signals and bikes would have priority around the roundabout in the same way as pedestrians. It is a neat solution that would have worked well at this particular spot. So why didn't TfL put a proper Dutch roundabout here? My understanding is that some of the rules and regulations to build the Dutch roundabout haven't yet been signed off by the Department for Transport but that's on the way soon and TfL has indicated it will build one of these in London in the near future. The Dutch roundabout would have worked pretty well here, in my view. And I think most oberservers think similarly. A simpler solution for Queen's Circus? So why has TfL plumped for something that takes elements of the Dutch roundabout and then super-complicates them with traffic lights? The clue is in the Wandsworth council committee papers. Three of the five justifications for this design are related to motor traffic flow and guess which is the top priority? "There is limited means of managing queues that develop or ensuring equitable discharge of traffic around the roundabout". So, the traffic light-heavy option has been chosen here in order to manage motor traffic flow. 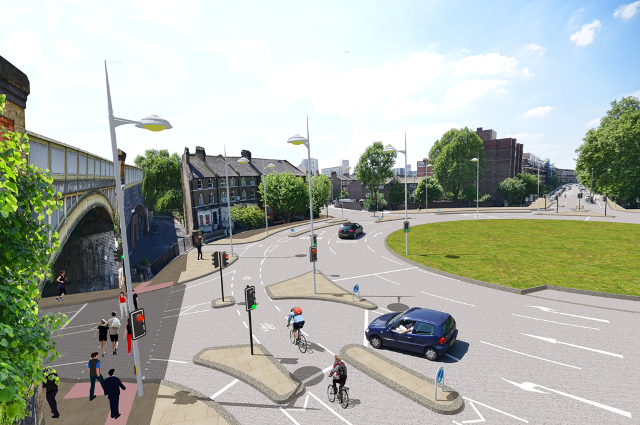 To its credit, Wandsworth points out that "At an early stage in the design process, TfL made it clear that a conventional approach to designing a roundabout with traffic signals would be unacceptable within the context of their “Better Junctions” review and the Mayor of London’s cycle vision for London." Good, and well done TfL. But there's no getting away from the fact, this roundabout has been designed to manage motor traffic flow first and foremost. It does create significantly better crossings for pedestrians. And it does create a Dutch-"style" approach that gives space for safer cycling around the roundabout. The whole thing feels over-complicated for both pedestrians and cyclists who could have benefited better from a proper Dutch roundabout, as displayed above. This would have given people on foot and on bikes priority over motor vehicles. What we have here is have a heavily-engineered and heavily-managed splurge on traffic-lights to manage motor traffic queues, with bike tracks and pedestrian crossings working around the motor flow. It feels like the traffic light people gatecrashed a party that would have worked much better without them and that the design should be the other way round: people on foot and bikes get priority, motor traffic flows follow them. I'll credit TfL with creating better conditions for cycling and walking here. But the underlying principle behind this design isn't quite right. This is good place for young cyclist I am glad to see this, if you are planning to buy bike gadget I suggest you to go through with Basecamp Bike Helmet ReviewI am sure this is very useful for you and your cyclist kid.